Here are a few topics many people have questions about. Further a more in depth explanation of many of these questions, go to our FAQ articles. If you have a question that is not listed, contact us. Why should I rent from Tents For Rent? We guarantee you high quality tents and great service. 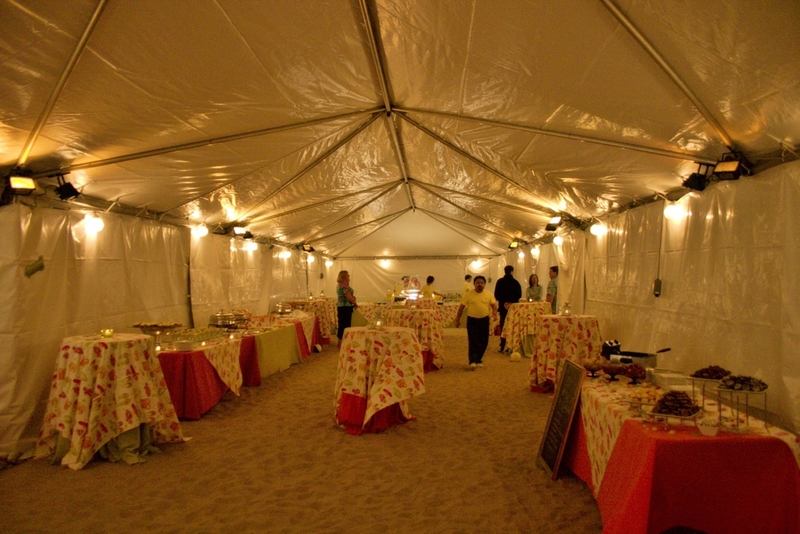 We have a large range of tent sizes and colors to cover events large or small. We purchase only high-quality, heavy-duty tents. We maintain our inventory and inspect it regularly so that you and your event will look great. Our experienced event planners will be happy to help you plan the perfect celebration. We work with a network of area professionals: caterers, florists, decorators and event venues. Our professional team will install your tent in a timely manner. Our team's goal is to surpass your expectations. We will make every effort to accommodate any special needs or requirements. What else do you rent besides tents? What do I need to know in order to plan my event? How many guests do you plan to have? Will the guests be seated at tables and chairs or chairs only? Do you need space for a food table, head table, dance floor or anything else? What date are you planning your event? How can I visualize what will fit into a tent? We would be happy to create a customized CAD layout for you. You can also create your own at Wedding Wire. Do you deliver and install the tents and accessories? Our price includes delivery and installation for all of our rental items except for tables, chairs and linens. We can install and remove them for a small additional fee. All events are priced based on location, size of tent and duration of event. Please complete our get a quote form and we will send you a quote promptly. Do you have any suggestions for sites to hold my event? Please click here for venues that we recommend. How do I decide what size I need? And don't forget to add extra area for your band, DJ, Podium and etc. What tent sizes do you rent? How far ahead of time do I need to reserve my tent? Reserving as far ahead as possible will ensure the widest selection of tents and accessories; however, we will do our best to accommodate your needs no matter what your time frame. All tents are rented on a first-come-first-served basis. So, it is a good idea to reserve further ahead, especially in the busy summer months. However, we can usually take orders with only a few days notice. Here is a map of our normal delivery area. We serve Pennsylvania, New Jersey, Delaware, Maryland, Virginia, New York, and West Virginia including the cities of Philadelphia, Harrisburg, Lancaster, York, Carlisle, West Chester, Allentown, Wilkes-Barre, Washington, New York, Baltimore, Pittsburgh, Trenton, Newark, Wilmington, Dover, State College, and surrounding areas. If you are outside this area, please contact us. We'd be glad to give you a custom quote for delivery to your area. Pole tents are our most popular style. They have tall, graceful peaks and an airy, spacious interior. They are also more economical. Frame tents have no interior poles and can be secured with weights where stakes cannot be driven into the ground. They can also be placed against another tent or building because they don't require extra space for ropes and stakes. Do your tents have sidewalls and how do they work? Sidewall are very simple to install and remove. Matching sidewall are included free with the rental of most tents. 1. Roll out a section of sidewall between the poles and the stakes of the tent. 2. Clip the snaps along the top edge of the side wall to the thin string that goes around the edge of the tent. 3. Where two sections meet, clip the buckles together. 4. It's that simple. You can hang sidewall on any part of the tent you want or enclose the entire tent. This is a concern that many people have. However we purchase only heavy-duty, commercial grade tents that are made to handle what the weather can dish out. We can provide tents that are engineered to withstand 90 mph winds. If you should have any problems during the time the tent is up just call 717.733.9700 and select option 3 for emergency. Our crew of professionals is on call 24-7-365 for your peace of mind. Do you provide tents for large events? We've been covering the Northeast's most prestigious events for over 25 years. We provide tents for weddings, bar/bat mitzvahs, backyard parties, church events, graduation parties, auctions, car sales, grand openings, ground breakings, celebrations, birthday parties, graduations, fundraisers, natural disaster relief, temporary storage or shelter, festivals, sales and much more. So, whether you need a tent city or a tent for your backyard party, we've got you covered. Can you recommend any caterers or event planners? Please click here for the caterers and event planners that we recommend. I'd like to add some wow to my outdoor event. What can I do to make my event unique? Having an event outdoors is enough to make it extra special. However, there are lots of other ways to make your event one that your guests will remember for years. A tent is like a blank canvas and what you do with it is limited only by your imagination. We can light the tent ceiling with various colors of lighting. We can cover the tables with an dazzling array of linens. You can choose from a variety of chairs. We can cover the ground with flooring and carpet. Is the weather too hot or cold? No problem, we provide heating and air conditioning. And, don't forget to add cathedral window or clear sidewalls to your tent. I'm planning my event on a limited budget. How can I save money? We've been working with our customers to save them money for years. Here are a few suggestions. Brown chairs are half the price of white chairs. Half-length linens are about half the cost of full floor-length linens. Choosing a striped tent instead of an all white tent will save you some cost as well. Also, if we deliver the tables and chairs and you set them up and restack them, you'll save that cost. We have many different lighting options for our tents. In many cases, globe lighting is the most cost effective. Where can you install tents? Virtually anywhere! Typically we install the majority of our tents on grass, asphalt or concrete, but we've installed tents on rooftops, on the beach, on an island, in a stone quarry, and many other creative locations. We accept check or money order as well as MasterCard, Visa and Discover. We normally require a 25% deposit on reservation of the tent and the remainder is due at delivery. Please contact us to arrange other payment terms. We would be happy to work with you. How do you set up tents? Can tents be erected on asphalt or concrete? Certainly, we can even patch the holes in asphalt. Below are a picture of the 1 inch diameter hole that we create in the asphalt and a picture after the repair. Over time the patch becomes almost invisible. Alternately, we can use weights to secure the tent and completely avoid driving stakes into the ground. Tents can also be installed on concrete. Please mention it when you place your order so that we can bring the proper tools to drill through the concrete. Can tents be installed without stakes? A tent can transform even the most challenging area. We can provide weights to secure tents that cannot be staked. Please mention this when ordering. This does significantly add to the cost of installing the tent. There are companies who will install tents with a very minimal amount of weight. As part of our commitment to you, we will be sure to secure our tents in a safe manner even though this may be more expensive. Securing tents to weights is an excellent way to provide shelter even in difficult areas where stakes cannot be driven into the ground due to underground utilities, hard surfaces, or asphalt that cannot be disturbed. Depend on Tents For Rent to work with you to turn your challenging space into an amazing event space. May I cancel my tent if the weather is beautiful? That's a great question. Many people want the security of a tent but would like to hold their event in the open air if it's a nice day. We are happy to work with you on this. It works like this: when you reserve your tent, you pay a 25% deposit. If your event is on a Saturday, we normally install the tent on Friday. You may cancel the tent as late as Thursday by 9:00 AM and not need to pay any more than the deposit that you've already paid. By that time, you should be able to have a good idea of the weather forecast for the weekend. There are two exceptions to this: linens need to be cancelled one day earlier than tents in order to get a 75% refund and permits are not refundable at all. If you want even more time to make a decision, you may pay 50% and cancel any time up until the arrival of the installation crew. When do you setup and remove the tent? The base rental price includes up to three days of usage. For example, if you are using the tent on Saturday, we can install the tent on Thursday or Friday and remove it on Monday. This gives you time for setup or decorate as needed. Tents can be rented for a longer period of time as well. May I specify a time to have my tent installed? Normally we will contact you one or two days before the tent will be installed to schedule the time to deliver the tent. If you prefer to have us deliver the tent at a specific time, please mention it when you place your order. Can my tent be heated or air conditioned? When you first think of an outdoor event you likely think of spring and fall as the best time of year, but tents are a great place for your Christmas party or other outdoor winter event. The extra challenge of a wintertime tented event will be more than paid off as you sip hot chocolate and watch the snow fall outside. We have extensive experience with winter tenting for Christmas parties and other special events, car sales, temporary storage and much more. Rely on Tents For Rent for all your winter tenting needs. What type of events can you use a tent? A tent can provide the perfect atmosphere for nearly any event. Just use your imagination: weddings, backyard parties of any size, corporate events, sales promotions, bar mitzvahs, bat mitzvahs, formal dinners, auctions, fundraisers and much more. What is your largest tent? We have tents that come in widths of 10 feet to 100 feet. They can be expanded in length up to hundreds of feet long. Currently, the largest tent we've installed is a 100' x 290'. That's large enough to seat over 3,600 people. Since tents are expandable, we can create even larger tents if necessary. Contact us, see our tent glossary or read our tent trivia.